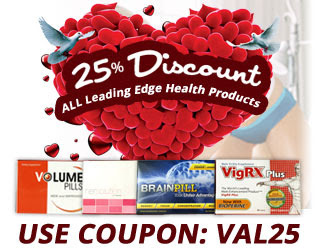 We’re pleased to say you have a 25% discount on ALL Leading Edge Health products for February. Consider it our way of thanking you for the awesome start we’ve had to the year. We’re barely a month in to 2018 and many of our affiliates have record earnings already. Enter code VAL25 and they save 25%. Any product, any website – for the entire month. Valentine’s Theme – All products are 25% off, including VigRX Plus. Exclusivity – This offer is ONLY available to you, and not the general public. Value – EVERYTHING is 25% off for you!